My husband was in the hospital this week. Nothing terribly serious but enough to be there for a few days and to worry us. Panic. Panic. I hate when he is sick and unfortunately this is not an irregular occurrence for him to be shuttling off to doctor appointments, going to urgent care, going to the emergency room, being admitted to the hospital. He didn’t marry me for my health insurance right? The bills pile up and up. We try to stay on top of them and have done a good job. Sometimes we have to work out payment plans with doctors but we get by. We have started going to urgent care rather than the emergency room unless someone is unconscious or bleeding profusely from the head because it’s much cheaper and a shorter wait. But unfortunately there are those old bills from when he didn’t have insurance before we got married. While we were in the ER and they decided to admit him, my husband said that that was a good thing because insurance makes us pay less in coinsurance when you are admitted vs. just in the ER. Obviously money is something that is at the forefront of our minds. Yep, with all the doctor appointments we have both had recently and our dog’s skin rash, we have had a lot of vet and medical bills. When it rains it pours. It’s worrisome when something happens because we know that in a few weeks we will get bills rolling in. But its even more worrisome when we are sick. It is easy to panic and worry about the numbers, but when push comes to shove, I don’t care. Money is just money. It comes and goes. I have to remember that it is like water and is sometimes a river and sometimes a stream. It is easy to get wrapped up in it but when I stop to think about priorities, it doesn’t win out. For me, money takes a back seat to the health of my family. 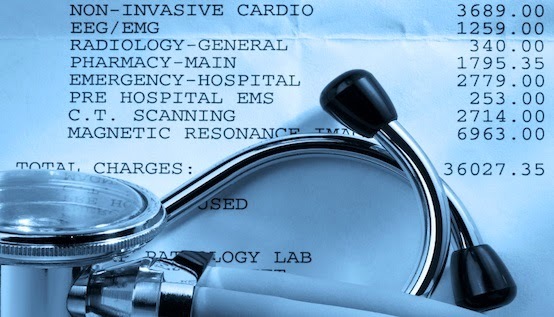 Obviously we don’t want to go into debt for medical bills and we sometimes ask twice when we wonder whether they really need to do that expensive medical test. But I would gladly pay (well, maybe not gladly) an arm and a leg if it means we can be healthy and happy in the long run. Priorities. Family and health first. I can worry about the money later. Hope your Husband is doing okay now! My Husband always says, "it's just money, we get more next week." Heh…. which is true, but man, it doesn't always make me feel better about the constant bleeding of money that seems to be happening! Thanks Jena! He is feeling much better. And I agree, while we can make more money I still don't like to see it go away!